The Itumbahal complex is full of many bahas, nanies & chukas (the typical Newari names for narrow lanes connecting rows of household compounds and other compounds). Every compound is dotted with many votive stupas, sacred shrines, wells and sacred objects of worships. The proper shrine of Itumbahal is flanked by two big rectangular compounds of Tahanani in the west and Itumbahal courtyard in the east. The main entrance of Itumbahal shrine is from eastern courtyard of Itumbahal. The courtyard is connected by two narrow gullies of Chokachen Gulli in the south and Kilagul in the north. The eastern courtyard of Itumbahal is divided into two halves, northern half is known as Baha cho (top end of baha) and the southern Baha ko (lower end of baha). The northern border of proper Itumbahal shrine is shared with Taranani (The shrine of Goddess Tara) and Baku nani– a small shrine housing a votive chaitya in the south. There is no inter-connecting doorways opening towards those shrine of north and south. The proper Itumbahal is perfectly square shape with two-storey structure made of wood, bricks and clay. 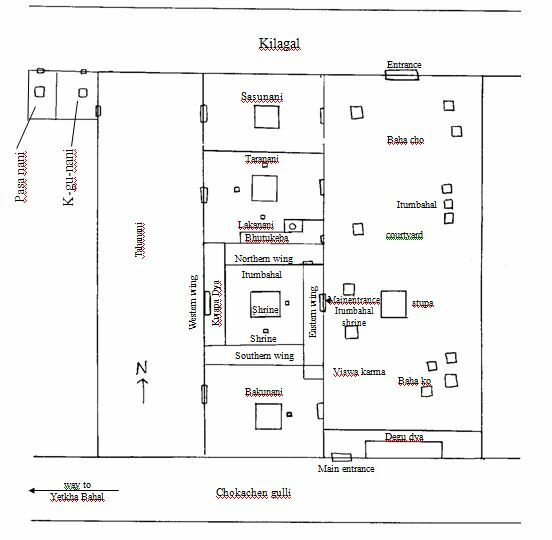 The area of proper Itumbahal shrine is – 7893.14 sq ft and it is located at ward No 26 of kathmandu metropolitan city.